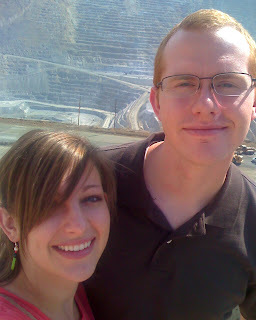 For our date this week, Squire and I went to experience the largest man-made excavation on Earth - Kennecott Copper Mine in Bingham Canyon. It was pretty amazing to see. The trucks they use to bring up the land, are as big as a house. 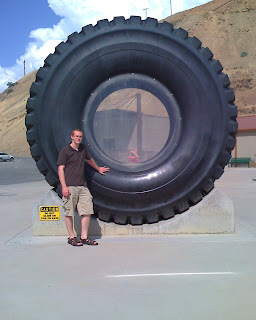 You'll see with the pics of Squire and I standing by one of the trucks' six tires. We had fun learning more about the process of refining copper. Did you know copper is in pretty much everything we use everyday? Us trying to smile for the cell phone camera with the sun making us squint. 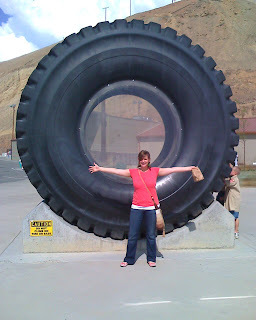 My wingspan is about half of one of these tires. 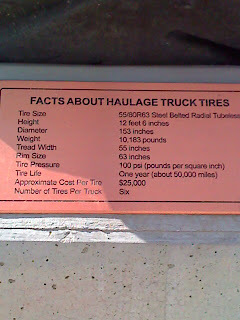 Here are the facts on those tires. Pretty unbelievable. 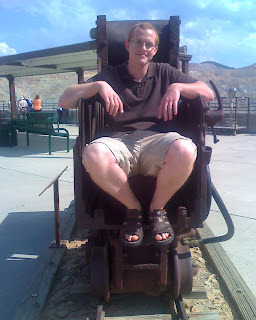 This is Squire sitting on a hundred year old mining cart that he probably shouldn't be sitting on, but it does make a fun picture does it not? 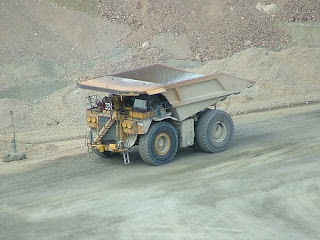 This is Kennecott Copper Mine. You can even see it from space! This truck is the size of a house!! P.S. I promised a long long post ago I would post pictures of these! I made these cute magnets for our Relief Society Whiteboard - they make it so easy and fast to write on the board each Sunday! Those are darling. 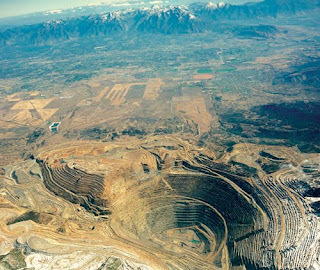 I have to say my Grandfather used to work in the Kennecott Copper mines, a long time ago, in fact for their 50th wedding anniversary we all went and took a tour and everything. That's a hip/homey tablecloth if I ever saw one in RS! Great date! Sounds like fun. Also, awesome job on the closet! I've got to get to primary to clean up the music stuff in the closet. Wow Jamie, your ward is so lucky to have you as a RS Pres. The tablecloth is awesome and gave me some great ideas! I also love the magnets. You are so creative, thanks for the tips!